Written 1908 by Mabel Sugg Brown, later Mrs. John Raymond Moore of Ayden, NC. Prepared for Internet with additional notes, S.C. Edgerton, 2004. 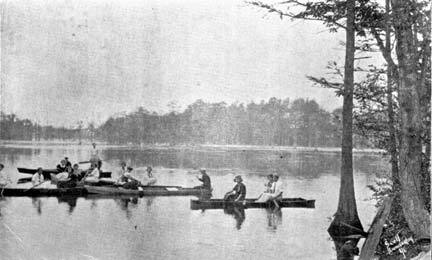 Photo of Brown's pond taken from Catalogue of Philadelphus High School and Farm-life School 1922-23. The following essay, entitled "Early Days," is a verbatim account of the history of secular education in the Philadelphus community of upper Robeson County, North Carolina, and was written by Mabel Moore in 1908. The version below has been typed from a worn photocopy of an older typed original. The worn photocopy is from the collection of the late J.S. Edgerton, Jr., of Philadelphus, and includes two photos on its front page. One is a photo of Mabel Moore in her later years and the other is a photo of Philadelphus Presbyterian Church taken from the second story of the Philadelphus High School, the burned ruins of which were removed in the 1980s. The town of Philadelphus, growing up above and around the banks of beautiful Brown’s Pond there [pictured at left, and now called Buie's Pond], was for several decades a small but bustling community with many houses, a church and manse, a gristmill, stores, a boarding house, a teacherage and a long succession of schools dating from the eighteenth century. The community's citizens opened their doors to teachers and students who could not board at the growing school at Philadelphus, and many of these relationships continued for decades afterward. As a township, the Philadelphus area stretched over several square miles and encompassed many family farms. At one time, all along this township’s roads, many farmhouses large and small were seen nestled beneath shading oaks, pines and pecan trees. “OUR SCHOOL is young in name, age and history, but it arose from the ashes of Philadelphus, Buie, and Gum Flat Schools. It can trace its ancestry back to the eighteenth century, but its origin is not known. The school is situated on the banks of Richland Swamp, where schools were first established in the latter part of the eighteenth century. The vicinity was settled by Scotch immigrants. They were nearly all Scotch until about twenty years ago, when settlers from South Carolina moved in. All are farmers, raising much cotton and corn. They are devout Presbyterians, and strict observers of the Sabbath. The past generation would walk over twenty miles to attend church. While these people cleared the woods to make their living, the thought of education was slowly working its way to the front, but the Revolution stopped them for a few years. After the Revolution cleared away, they made a movement for churches and schools. The schools were not very large, but were good ones for the hard time then. In the year of 1800, the grandfather of the writer of this essay, W.H. Brown, went to school at Philadelphus Academy, when he was seven years old. It was on the south side of the road, just on the rise of the hill, on the east side of the branch. It was about 275 years from the present school. The old school was built of logs, with a dirt floor, and the whole end of the house was built into a chimney. The desks were logs, split half in two, and the legs were so long it was difficult for a child to get on them. From this school, three eminent ministers went to the Seminary. They were the Rev. Mr. Archie Smith, Joseph Brown and Daniel Smith. This old school disappeared before the Civil War, but the exact date is not known. The old school house that is now standing was built in 1853 for a Session House by the Philadelphus Church. Mr. Daniel McMillan contracted for the building of the house for $600., and employed Messers Hector McNeill and Archie McMillan to do the work. The saw that cut the lumber is now in the possession of Mr. D.A. Buie, who helped to make the brick for the chimneys. The old saw is a curiosity as it has only two teeth and was run by water. Mr. Buie’s father and brother sawed the lumber to build the school while he helped with the brick. After it was completed, he attended school, and years later, taught there. The school house was complete with eight glass windows, which were rare then. It had a good floor, a good brick chimney and the best cover that could be afforded. While this school was going on, another school rose to view. It was a log house, but the school employed some of the best teachers to be had in those days. It was called Gum Flat. Many patrons of the present school started their education at Gum Flat. Mr. Malcolm McNeill was the first teacher that taught at Philadelphus after the new school house was completed. Miss Katherine J. Buie taught at Philadelphus during the Civil War. She lives yet (1908) to tell of her boys and girls of the 60’s. She told me one story of how her children planned to get their Christmas vacation and failed. When Christmas drew near, her pupils made a plot to arrive to arrive at school the next morning before she did. They were going to get inside and keep her out until she promised them a vacation. But some long-tongue told the teacher. Next morning, she rose before day, had an early breakfast; then, with her brother as protector, she started for school. It was so early that she saw families along the route eating breakfast by candle light. On arriving, she rang the bell in the old church steeple, then quietly waited their arrival. The children came earlier, expecting to get there before the teacher did. When they entered the room, they beheld Miss Kate in possession. However, she never mentioned their cherished plan now gone astray, but had them studying by sunrise. Mr. William J. Stewart of Antioch, was the second teacher at Philadelphus, Mr. Smiley McGill of South Carolina was third and Mr. J. Patrick Smith was the fourth and taught two terms. Others followed; each helped the education of the boys then, and now those same boys are the patrons of the Philadelphus High School. In the meantime, the new Philadelphus Presbyterian Church was built higher up the mill pond. After the completion of the new church, the school house was moved up from its old location. This was in 1860, the year before the war. Miss Kate Buie taught the first session after it was moved. Miss Kate Murphy McLean taught during the war, also. Although that school is dead, its workers are living. Three of our highly talented physicians went to the school at Philadelphus. These are Drs. J. Luther McMillan, B. Frank McMillan, and J.N. McPherson of Union County, Mississippi. Philadelphus has sent out many professional men: Judge McKay of Texas, Mr. William Brown, a lawyer of Birmingham, Alabama, and others. This country lay in Sherman’s route, when he was marching toward Goldsboro where he had his last fight. He passed by on the ninth and tenth of March, 1865. His march brought the school to a close, which was then taught by Mr. D. Murdock McCormick. One of the pupils remarked recently that Sherman was a popular man with the pupils, for they desired school to end. Then came the days of reconstruction. There was a struggle for many years, for what was not consumed during the war, was destroyed afterward by the lawless band of Federal men. It took many years to gain a substantial footing, but when they did, education was the first thing that made an impression on their minds. They employed Mr. N.G. Murphey to teach at Philadelphus. After the war, other schools branched out in the neighboring vicinity for a few years. The “McCallum Schoolhouse”, so-called as it was near the home of Mr. A.D. McCallum. The children called it “Midway College”. There was another school at Buie and one at Red Springs. These schools were run partly by public money and partly by subscription; therefore, they ran but a few months. They had no school at Philadelphus for several years, but it was taught at the McCallum school house by Rev. G.T. Pace until 1903, when he accepted a position at the Red Springs Seminary. Then the patrons of the old school, awoke to the necessity for a better school and one of a longer term. In the summer of 1902, they united the Philadelphus, Gum Flat and Buie Districts at Philadelphus. The, Dr. Claude Poole, a brother of our present county superintendent, Mr. J.R. Poole, taught. He taught a five-month’s school. We were in the same building that our fathers, mothers, uncles and aunts had been to school in years before. The same old desks and blackboards, which were boards painted black and nailed to the wall. As it was a one-room building and small, it was not large enough for the children who used to be in the three different districts. They began to make arrangements for a new building, but had no land to build on, as the old building was on the church land. The church owned twelve acres of land that had been purchased years before form Mr. John McArthur. It was nearly all high land, and heavily timbered with pines. The session deeded an acre of land to the school. The old building was standing on it. The committee sold the house to Mr. J.A. Humphrey, and the proceeds went into the new building. The pines were cut on this acre and hauled by Mr. J.A. Humphrey and sons to the sawmill of McKay and McMillan, who sawed the lumber to build the new school house. Mr. N.P. McNeill took the contract to build the new school house. That same year school began on September 13th. It was taught by Rev. G.T. Pace, who rode every morning from Red Springs, a distance of over four miles, until Christmas when he moved into a house built by Miss Anne Eliza Buie for the school to use for a boarding house. In January, 1905, we moved into the new building with Mr. Pace as principal and Miss Annie Harrington as assistant and teacher of music. We were in a new building with two large rooms, a cloak room, a music room and two vestibules, but we still had those old home-made desks, but we were not to wait long for the new ones. They arrived April 27th, but we used them only two days before school closed. It closed the fourth and the fifth of May, with an address by the Hon. J.Y. Joyner on the sixth, and a big picnic. The next session was taught by Mr. Pace with Miss Harrington as assistant and Miss Ela Steed as Music teacher. This was subscription school until the first of January 1906, when public school began. School ran until May 15th and 16th, closing with an address by Mr. Judd, county superintendent of Wake. We had a large picnic on that day, and the next day, a meeting was held to vote special taxation. It was gained by a majority of one vote. Mr. Pace taught the next session of 1906 and 1907, with the former assistants. This session was all public school and closed on the twenty-third of April with one night for the exercises. It was the poorest one we ever had, as it rained so hard that night that many of the children failed to come. The next session started out with Professor Harllee McCall as principal, Miss Annie Harrington as Intermediate teacher, Miss Katie McI. Buie as Primary teacher, and Miss Ela Steed as teacher of Music. This year, the school received an appropriation of five hundred dollars from the state; therefore it was high school and had a state teacher. Professor McCall organized a Literary Society on September 13, 1907, with about twenty members. This society has been a source of profit and pleasure to the members. It has adopted the name of the Philadelphian Literary Society, purple and gold as colors and the pansy a flower. The school has been more progressive in study and the children have shown more enthusiasm and are more willing to attend regularly than ever before. Everyone is willing to do what Mr. McCall thinks will be an improvement. The Philadelphus High School is only five years old but it has sent out two teachers, Misses Cora McNeill and Susan Buie; two stenographers, Misses Jennie Kelly and Julia Pate. This year we had an enrollment of about seventy-five pupils. These pupils represented six school districts. Philadelphus no. 1 was built some time in the 18th century, we do not know when. Philadelphus no. 2 was built in 1853 and still stands within three hundred yards of Philadelphus no. 3. The first Philadelphus has gone completely out of existence. Philadelphus no. 3, built in 1904, stands stately and tall among her long leaf pines. And join us in signing our lay. We’re girding ourselves for the strife. Help much in the battles of life. To honor thee, broad o’er the land. Yes, we’ll sing of the P.H.S., bless her!